Everyday Art: Guess who got goats! We put up the goat fence, built the house, read a book and were ready for the real deal! Five, very cute, minis. They are so tiny and sweet. This one here is Oreo. 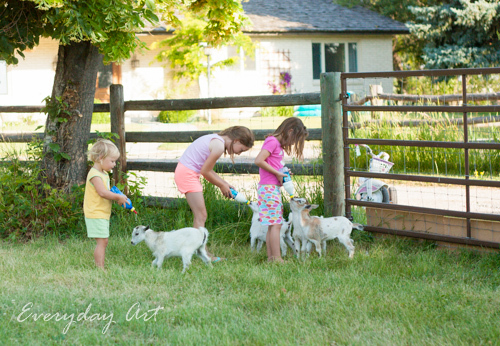 I knew my kids would enjoy this, but I have been surprised at how much fun they have been having with their goats. My girls play with them like dogs--run through the field and play around. The best is feeding time though. 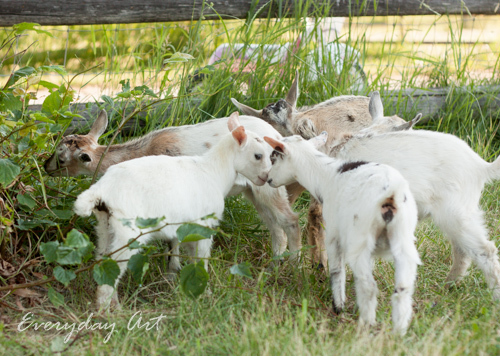 These goats are young enough that they still need to be bottle-fed, so every morning and evening we are out there with bottles of goat-formula for our babies. 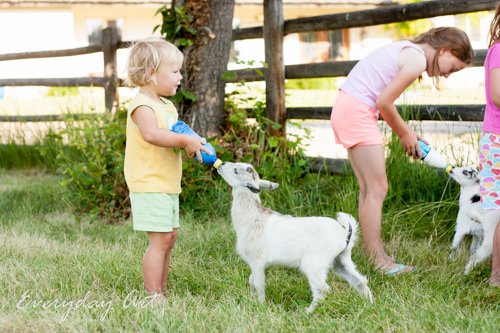 My youngest is feeding "Skip" in this image. 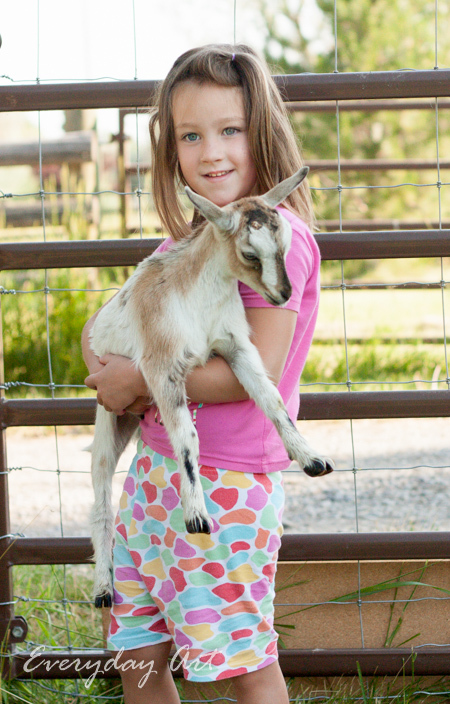 I think it is sweet to have my girls up, first thing in the morning, still in their jammies feeding the goats. They get quite the kick out of it too. Initially we were just going to get three. 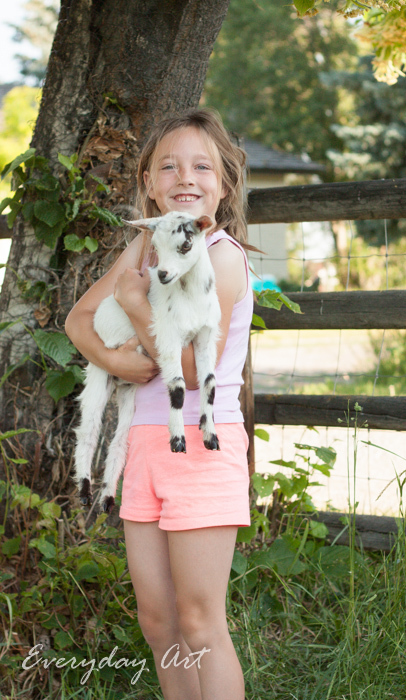 But, the people we bought them from were bottle feeding 5 baby goats--the 3 my girls chose, plus 2 others. One of the others was my favorite, so I decided I wanted him too, and how could we leave just one? They were rather attached to each other, so we bought one for my husband too. The little white one below is just tiny and has been named (by my 2-year-old) "Sleeping Beauty." 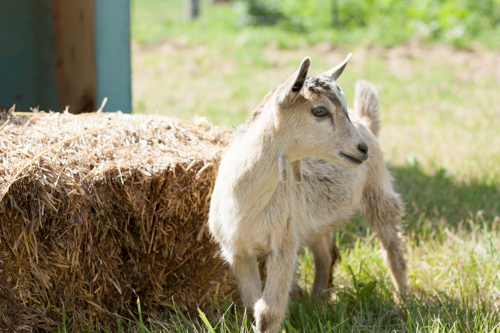 Poor little boy goat. And here's mine--Tanner. He is the most friendly. Apparently his mother rejected him and so was raised by people. Consequently, he is the most attached to being with people. When we walk away he cries our "maaa! maaaa!" SO LOUD. Kind of pathetic really. And when I pick him up, he just snuggles in and is perfectly content. Too fun. What an adventure we have started. Farmer B's Recipe for Goat Fencing: hog panel base fence, 1/2 hardware cloth (4') 7' deer fencing up 8' high PT posts cemented in the ground. Goat feet are like sneakers. If they can get the tip of their toe into the horizontal place, it serves as a climbing surface. show panels for goat stalls have only verticals with a 4" spacing. Think like a goat. Whatever you have inside your pen CAN'T be as good as what is on the outside. A thought for Sleeping Beauty: call him Beau. It's a PART of her original name. Just the boy part. The French word is beauté (pronounced bow-tay) so you ARE really using her name.